Here's the last episode of the musical variety series, "Here's to Romance", from my collection. 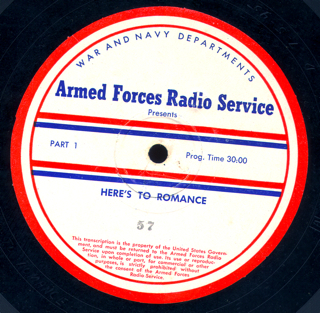 Program 57 of the series as it was broadcast on the Armed Forces Radio Network was originally heard on CBS on July 5, 1945. The first song on the show is "The Erie Canal". "Here's to Romance" regular Robert Ripley tells a "Believe It or Not!" story about a bombing that came close to destroying DaVinci's "Last Supper". Host Jim Ameche is joined by Larry Douglas, Ray Bloch and His Orchestra and guest Marian Hutton. This previously lost episode of the series was dubbed to digital directly from an original AFRS vinyl transcription; the date is from the disc matrix. We've been listening to a few episodes of "Here's to Romance" over the past few months. The show, hosted by Jim Ameche, was a half-hour of light music originally heard on CBS. This week's episode includes a regular feature heard on the program - Robert Ripley drops by to tell a "Believe It or Not" story with a special guest. 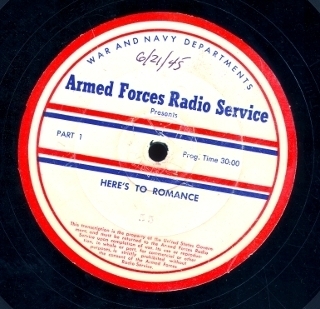 Program 52 of the series on the Armed Forces Radio Service, originally heard May 31, 1945 on the network, features a story about the only solider to receive the citations of the boot, the fish and the catepillar from his fellow soldiers. (You'll have to listen to the episode to find out what that means if you don't know already.) The first song on the show is "I Finally Got That Kiss". In addition to Robert Ripley and host Jim Ameche, Larry Douglas, Ray Bloch and His Orchestra, guest Marian Hutton are also heard on the program. The show was transferred from an original AFRS transcription and the date is from the disc matrix. The program appears to not be circulating among otr collectors. The remaining shows I have in the "Here's to Romance" series all include Ripley and "Believe It or Not" guests, so stay tuned for some intriguing guests! For you light music lovers out there, here's another episode of "Here's to Romance". This particular show was originally heard on CBS on March 23, 1945 and as program 42 in the series on the Armed Forces Radio Network. The first song on the show is "Down in Hechhatchawatchi". It's noted in the program that this is the one hundredth program of the series. Host Jim Ameche is joined by Larry Douglas, Ray Bloch and His Orchestra, and guest Martha Tilton. This previously uncirculated episode of the series was transferred from an original AFRS vinyl transcription. The date is from the disc matrix. Guest Mildred Bailey shows up on "Here's to Romance" in program 35 of the series as heard on AFRS and originally broadcast on CBS on February 1, 1945. The first song on the show is "Who?" and the program features Larry Douglas, Ray Bloch and his Orchestra and host Jim Ameche. 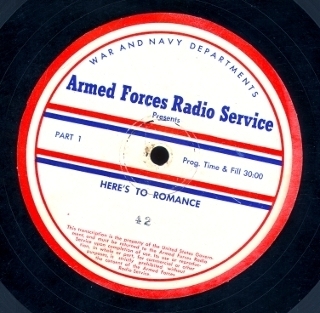 The program was digitized from an original Navy Department AFRS vinyl transcription; the date is from the disc matrix. I've got a half-dozen more shows in the series I'll be posting in coming weeks, some previously lost, that contain segments with Robert Ripley and "Believe It or Not!" guests. This week I'm kicking off a few episodes of a new series on the blog. I have a soft spot for pop music shows from the 40s and one of the better shows of the period was "Here's to Romance". In this post, we hear program 15 in the series as it was broadcast on the Armed Forces Radio Network and originally heard on CBS on September 14, 1944. Host Jim Ameche appears with Ray Bloch and His Orchestra, and Larry Douglas. The first tune is "Keep Your Powder Dry". 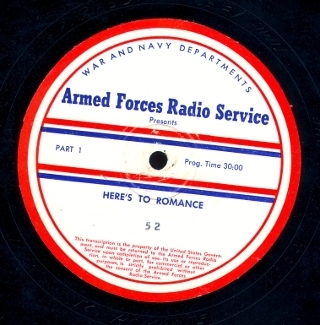 The show was transferred from an original War Department AFRS vinyl transcription. Date is from the disc matrix. I'll post more shows from the series in coming months - most I have include interesting "Believe It Or Not" segments with Robert Ripley and notable or unusual guests.